We sell the Northern Bobwhite Quail. These wonderful little birds are great flyers, delicious eating, excellent for training your hunting dog, and just fun to raise. They mature in 16 weeks and dress between 7-9 oz. They will have started laying eggs by 24 weeks and are prolific layers. Bobwhites can be put with other types of quail after arrival. Quail are either shipped by Express Mail or Priority Mail and come insured. Please open and inspect your shipment at the post office. They will usually arrive on Tuesday or Wednesday. 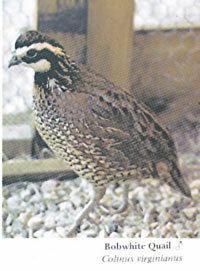 Quail must be shipped in warmer weather and are available from June through mid September. Quail are very popular and a delight to raise. We will begin shipping Bobwhite Quail the week of April 23. BOBWHITE QUAIL: For safe delivery, your order must total 100 or more birds. We can't mix the different breeds of quail to make 100. Before buying these birds, please check with the Regulatory Agency in your state that controls wildlife management. You may need a permit. The state of Wyoming requires a vet check on quail orders entering the state. That is an additional $50. per quail order. Do not give quail city water, as it contains too much chlorine and flouride. It is also recommended that the temperature at floor level be 95-97 degrees the first week, reducing it by about 5 degrees per week thereafter. **IMPORTANT** Baby quail need finely ground feed. If your starter feed is too coarse, it will need to be ground a second time before it is fed to baby quail. This will make it more palatable to the chicks. The following states can only receive Bobwhite Quail shipments from June 9-September 8: ID, ME, MI, MN, MT, ND, NH, NY, OR, SD, VT, WA, WI, & WY. Please book your order within these dates! Is this quail able to be winter hardy? Quail are typically not winter hardy birds. Do you sell feed for quail? We sell Organic Wild Game feed. A 50lb bag sells for $51.60 plus shipping. Does Illinois require a permit for Bob white quail? You would need to check with the Regulatory Agency in your state that controls wildlife management to see if a permit is needed. Did I understand correctly that shipping can't be done in Georgia for quail? We can ship the quail to Georgia. Not sure where you were seeing that. You would need to check with your regulatory agency to be sure a permit is not required for raising them. Do you sell adult birds? I need a couple of males to put with my females? Sorry, we do not have the quail available in older birds. Can we place orders smaller than 100, even if a premium needs to be applied? I'd like to buy around ten. No, the minimum is 100 so the babies have enough body heat to keep warm during transit. They are very tiny when newly hatched. Are the Northern Quail you sell old/large enough to release directly into the wild? We offer day old Bobwhite Quail chicks. You would need to keep the chicks under a heat source for 4-6 weeks. We do not suggest releasing quail until 16 weeks of age. Is it possible to get a mix assortment of just quail? We do not sell the quail in assortments. How old are bobwhite chicks at shipment? They are hatched and shipped on the same day. Sorry, we aren't sure where you can find dressed birds. Is there a license required to have quail in the state of Iowa? You would need to check with the Iowa DNR to see if a permit is required for raising the quail. I love their eggs. Which quail lays the most eggs? 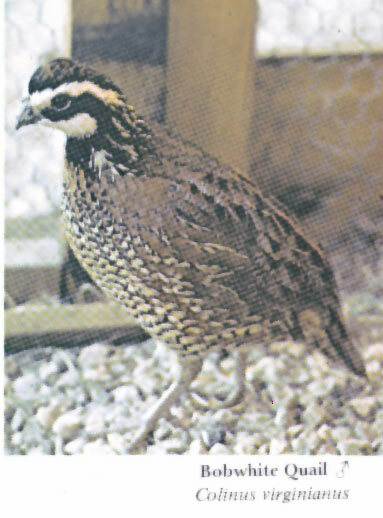 Bobwhite Quail are the most productive quail breed. The birds are not sexed.